The decision of 19 October of the Vice-President of the Court of Justice, ordering the Republic of Poland to suspend the effects of the Judiciary Reform Act and, in particular, to ensure that no sitting judge is removed as a result of the new retirement age, is revolutionary to say the least. The Court has entered a terra incognita, a place where no previous European court had ever entered into, forcing a sovereign Member State to choose between its membership to the club of European integration, or to walk away and follow the path of authoritarian illiberalism. To do this in an Order of interim measures, without hearing the defendant Member State, and two days before a crucial regional and local election in Poland, is quite a gamble on the part of the Luxembourg court. However, the stakes are so high that the Court was left with hardly any other choices. Unfortunately the Polish government has triggered a process and a style of governance that has eventually cornered it into an untenable position, a no-prisoners approach in which EU Institutions have now no other choice but to stand firm and keep calm. In contrast with other illiberal governments within the Union, notably Hungary, the Polish crisis is acutely visceral and radical. Looking at the Order from a strictly legal angle, the decision is quite an event and a ground-breaking precedent. Interim measures are exceptional means to ensure the effectiveness of a procedure, but they are mostly used to suspend the effects of EU acts. Challenges before the Court will usually involve private applicants questioning the legality of, for example, Commission decisions. The scenario in which a Member State acts as a defendant to which an interim measure can be imposed, is basically limited to infringement procedures brought by the Commission or by another Member State on the grounds of Article 258 TFEU. These kinds of interim measures are hardly ever requested, for the Commission is well aware of the reluctance of the Court to order Member States to act or refrain from acting in provisional terms. Such interim relief is granted on the grounds of Article 279 TFEU, a provision that gives the Court ample discretion to be creative about the kind of interim measure that the case deserves, but in practice they are scarcely requested and, as a result, hardly ever granted. In Friday’s Order, the Vice-President has not granted ordinary interim relief on the grounds of Article 279 TFEU, but a particularly urgent kind of relief. The Order relies on Article 160(7) of the Rules of Procedure, which allows the Court to rule prior to hearing the defendant Member State. These interim measures are used when the urgency is such, that the order must be granted immediately and therefore with no time to hear the defendant party. Therefore, there will be another decision on the interim measures soon, once Poland has been heard in writing and, most probably, in the course of an oral hearing. Furthermore, the Order is retroactive. The Judiciary Reform Act introduced a new retirement age for judges set at 65 years of age, and since its entry into force it has already served as a legal cover for the retirement of several sitting judges. Despite the fact that the Act had been suspended by the Supreme Court as a result of a preliminary reference sent to Luxembourg this summer, some of its provisions have already produced effects. Therefore, the Order imposes on Poland a retroactive suspension of effects that deploys the rulings’ effects from the moment of entry into force of the Act. And finally, the Order steps into a terrain which has traditionally been handled with the utmost care by the Court, but which is now an arena in which the Court seems comfortable to rule in far-reaching ways. When a similar action was brought by the Commission against Hungary’s reform of the judiciary in 2012, the grounds of review were linked to Directive 2000/78 and discrimination on the grounds of age. A rather low-profile approach for a case that involved very special “workers”, as is the case of national judges. However, this time around the Commission has brought the case against Poland on the grounds of Article 19 TEU, which states that the EU’s judiciary is composed of both EU and national courts, acting in conformity with fundamental rights and in full independence. This independence is now being questioned by the Polish reforms. There is hardly any other provision of EU law at stake, but this has been deemed to be sufficient by the Commission to bring such a case, and the Court appears willing to play ball. There are good arguments about competence that could be used against the Commission, but it seems that one thing is to reform a national judiciary, and quite another to launch a full-blown attack on the independence of all the high courts of the land. The Commission appears to be committed to fight the latter, but Poland will certainly argue that the competence of the Union is shaky to say the least. Nevertheless, last week’s Order has been slowly and carefully brewed in the Luxembourg futuristic anneau. In the landmark case of the Portuguese judges, rendered in early 2018, the Court set the tone for this new ground of review, and stated that Article 19 TEU, including its reference to independence, is a relevant parameter of review of national measures. Shortly before, in the case of the Polish forest of Białowieża, the Court ruled that in case of breach of an interim measure addressed to a Member State, penalty payments and pecuniary sanctions can be imposed by the Court at the request of the Commission, on a careful but daring interpretation by analogy with Article 260 TFEU (which provides for the Court to impose monetary penalties in certain circumstances). Before the 2018 summer holiday, in the LM case, the Court sent yet another powerful message by stating that judicial cooperation with Poland in the field of criminal law could come to an end In Poland if the European Council finally triggers Article 7 TEU proceedings against the Member State. Last week’s Order seems to be another piece in this terribly complex jigsaw puzzle that the Polish challenge is proving to be. But the stakes are high and the Polish government knows it. 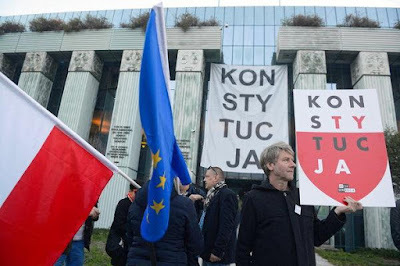 It is no coincidence that the Polish Prosecutor’s Office has recently brought an action before the Constitutional Court arguing that the suspension of effects enacted by the Supreme Court is unconstitutional. If the Constitutional Court sides with the Prosecutor (and the new composition of the Court inclines me to think that it will), the argument could be well extended to Friday’s Order. With that ruling from the Constitutional Court, the Polish argument will probably argue that proceedings in Luxembourg are ultra vires and not applicable in Poland. At that stage, the showdown will be inevitable and the Commission will have no other choice but to request the enforcement of the Order through Article 260 TFEU. Penalty payments will be imposed and Poland will refuse to pay following the ultra vires rationale. The Financial Regulation will have to be interpreted creatively so that the amounts receivable are offset by forthcoming payments to Poland. After all, Poland is a net beneficiary of the EU budget and it will not be difficult to ensure that the penalty payments effectively end in the coffers of the EU budget and not in the pockets of the Polish government. At that point, the Polish government will have to explain to its citizens why the generous contributions coming from Europe start to decline. The blame game might work for a time, but at some point the Polish people will realize that their government is not only risking their benefits, but even their European Union membership. Whatever the result might be, the Court seems committed to playing the role that it has been anticipating for several months now. Nothing appears to be stopping the Court from playing hardball in this new chapter of European integration, in which “integration through law” has now turned, to the surprise and concern of us all, into “integration through the rule of law”. A nice but worrying twist that puts Europe on the eve of a new chapter, in its always bumpy road towards peace and prosperity in the continent.